GOD’s intervention during and after the general elections is a wise decision which President Edgar Lungu has taken to save this country, says Christians Against Poverty in Zambia (CAPIZ) president Evangelist Gregory Chileshe. Evangelist Chileshe said it was important for people to pray to God to intervene in political matters that needed solutions. He said the country was heading towards polls and it was vital for political leaders to turn to God through prayers. Evangelist Chileshe said Zambia needed God’s guidance during the election period especially that the nation was engulfed by spate of violence during the campaign period. “Now those that like boycotting such meetings that call on God to intervene are not showing humbleness before God, because the fear of God is the beginning of wisdom,” he said. He called on political leaders to have a spirit of forgiveness and ensure they all attended the prayers and seek God’s guidance. He said Zambia was a Christian nation that should be guided by the Christian principals, saying shunning prayers was a mockery to God. 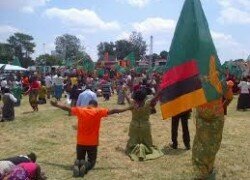 Evangelist Chileshe said it was the duty for all Zambians to take part in the prayers and that no political interference should stop the people of Zambia from any national undertaking. He said it could not be denied that there was political intolerance in the political arena, which was also the starting point for reconciliation because that was where the leadership of any country was starting from. “We urge all political parties to be humble and obey the voice of God, and we cannot run away from these principles because Zambia is a Christian nation and that the fruits must be seen through action,” he said.